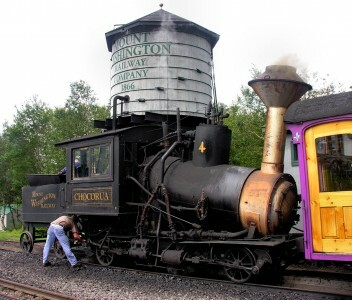 Steam locomotive at the Mount Washington Cog Railway in New Hampshire. This is a mountain climbing locomotive that runs on a track with a rack-and-pinion rail so it doesn’t slip on the steep grade. Notice the locomotive’s boiler is slanted when on level ground, which allows it to be level when the locomotive is climbing a hill.